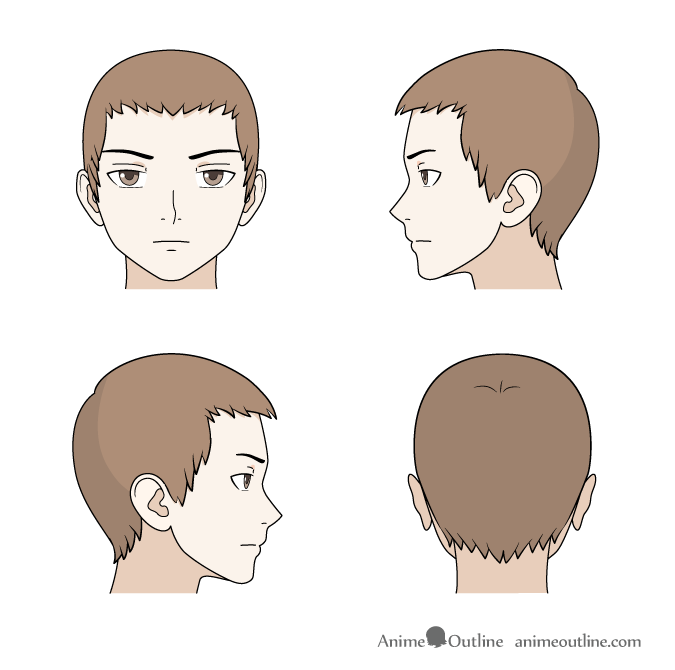 This tutorial explains the fundamentals of drawing different types of both male and female anime and manga hair. It also provides detailed example drawings from the front side and back views. 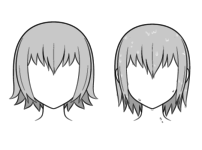 Before drawing hair it’s a good idea to have an understanding of the shape of the head and the hairline as shown in the examples below. 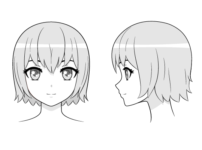 It can be very helpful to first draw the head before you start drawing the hair especially if you are a beginner. 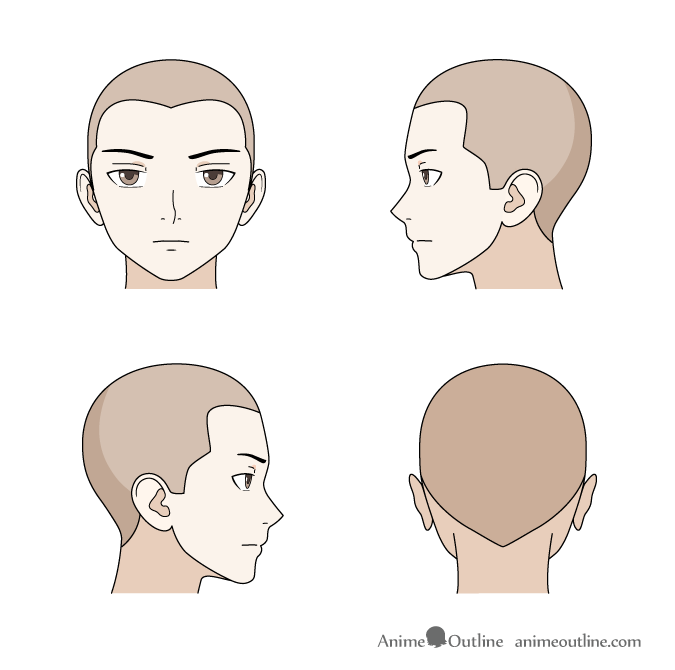 The shape of the top of the head in anime and manga is often fairly close to the shape of a real head but can also vary depending on style. 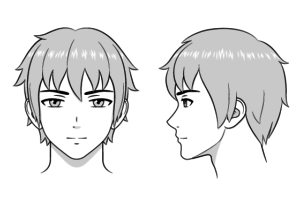 From the side view the head can be drawn in a slight oval shape (usually less so than a real head). From the front view the top of the head is close to a half circle. 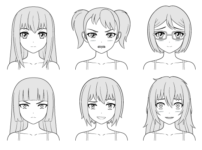 In this tutorial we will not go into drawing the different facial features and other parts of the head as that is already covered in other tutorials. 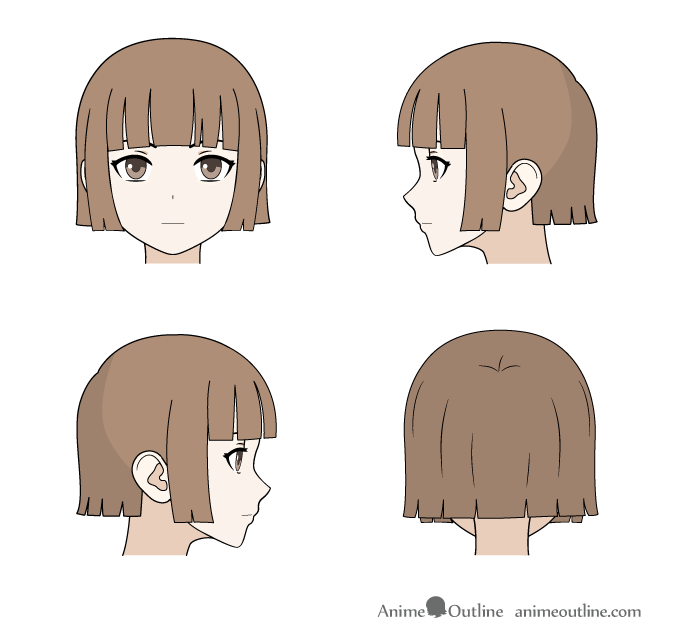 As anime hair is a simplified version of real hair it’s a good idea to also have a basic idea of how hair actually grows. The above example is a male head but the same would apply to a female head as well. 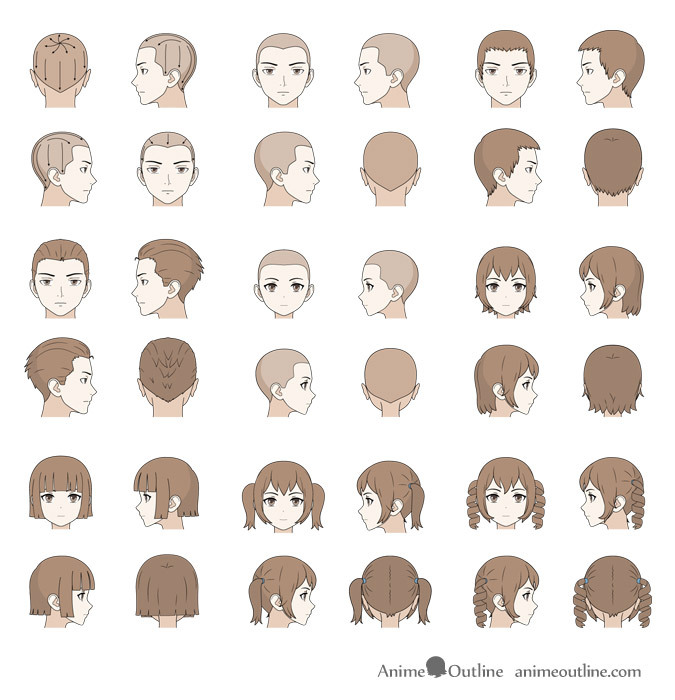 Anime hair is usually drawn in clumps sort of like real hair that is wet. 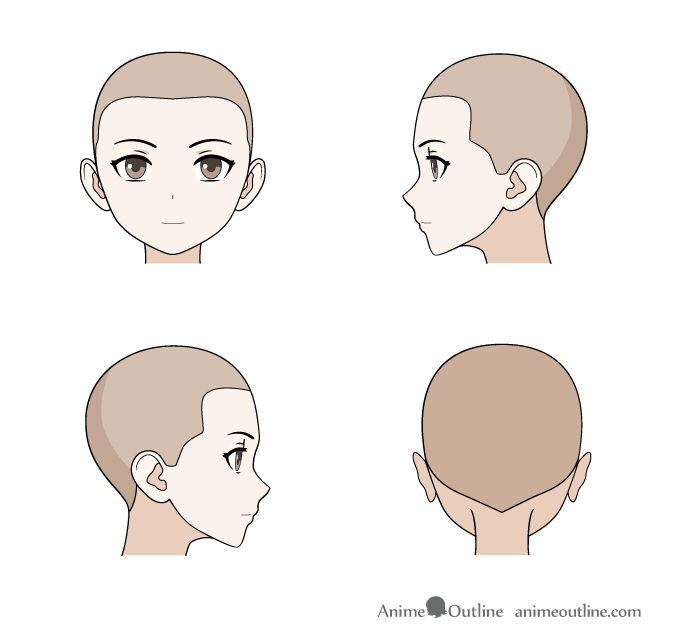 Drawing medium length or long anime hair is similar to drawing short hair but you can draw the hair in much bigger clumps. With longer hair you can also think of the sideburns as separate sections in addition to the sides top and back hair. As the hair is pulled/combed back like that in the above example it will reveal the hairline Therefore you can once again see why knowing the basic shape of the hairline is important. 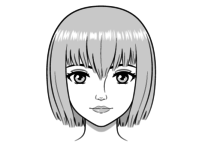 When drawing hair at the hairline draw some jagged lines to give it a more natural look (real hairs are not all perfectly aligned). 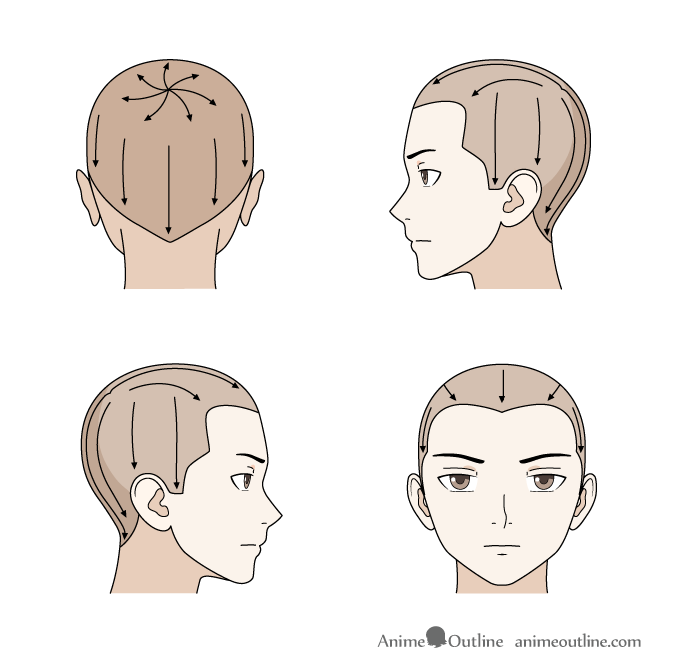 For trimmed neatly combed hair (like the popular “hime cut” for example that is so often used in various anime and manga) it can almost look like a helmet on the head. To make the hair look a little more natural draw some splits into the hair that are wider at the bottom narrowing as they go up. For pigtails draw some lines around the pigtail to indicate that the surrounding hair is pulled in the direction of the pigtail. With multiple pigtails you can also draw a parting line in the hair where the hairs that are being pulled in different directions meet (the back view example in this case). 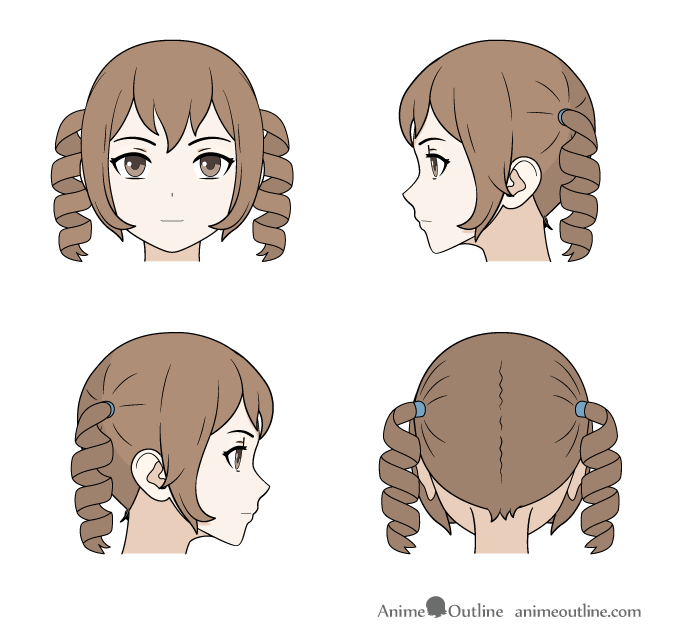 Draw the curly parts of anime anime hair similar to a spring. 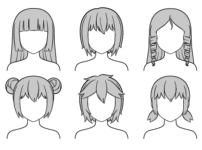 Shorter parts of curly anime hair often tend to be draw same as regular hair or with some light curves. 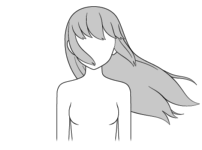 In this example we will also draw the hair slightly more curved at the ends. 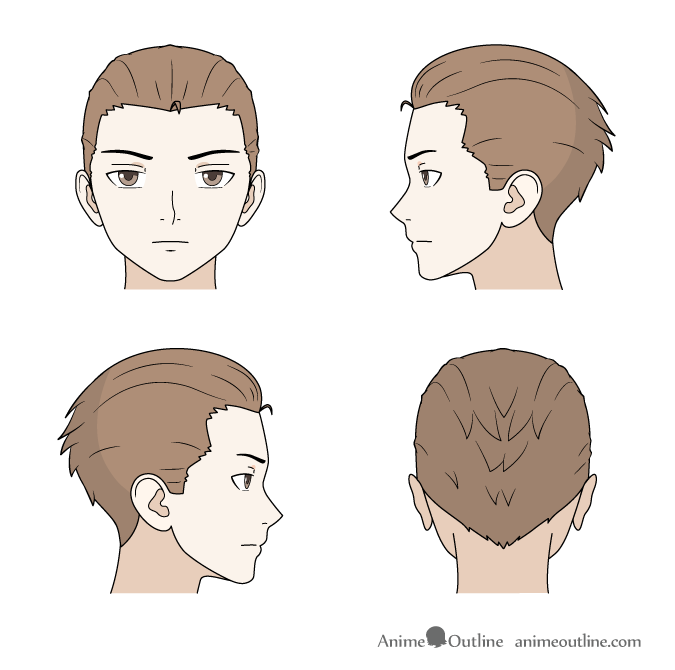 There are many variations of anime hair but the examples provided in this tutorial should give you a good foundation to go on. 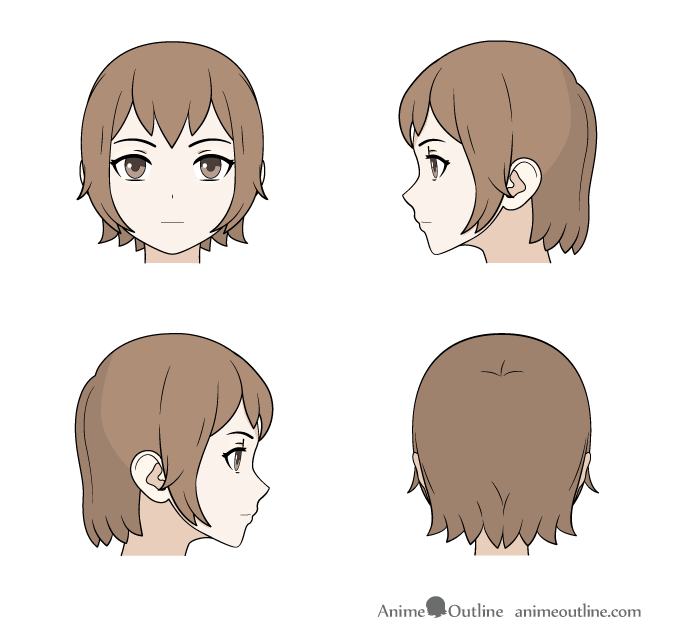 You can of course always look at real hair as well as examples of hair from actual anime and manga for additional reference.